In Willa Cather’s Death Comes for the Archbishop, Father Latour is a man of God who is devoted to both his church and its people. He is a meticulous man who takes his job very seriously. As an outsider to New Mexico, his point of view is easy for the reader to relate to. Furthermore, it plays a major role in creating the landscape and setting of the novel. Latour always tries to do the right and honest thing and is focused entirely on improving his own understanding of the people and land in order to improve his diocese. In using this character, Cather was trying to depict a man that the reader can easily empathize with. However, it appears to me that Latour is actually much harder to empathize with as a result. If this is all that the character is then his perfection makes Latour almost perfect. In other words, Latour is at a pinnacle of his goodness and I wonder where there is to go from there. Cather spends a lot of time on describing the beauty of the landscape. But she not only conveys an appreciation for the land, she also conveys an appreciation for the difficulty in surviving in the vastness. Furthermore, Cather also depicts New Mexico with a kind of mystery or magic. Sometimes it feels like home and other times it feels like Mars. It seems to me that the land is almost the primary protagonist in the story and Latour is only used as a lens that allows Cather to build a relationship between the reader and the land. Sometimes the land is described as peaceful and quiet and other times it is described as brutal and unforgiving. This is something that people who live there are constantly engaged with and as a result the land itself is an important character in the story. In Ralph Ellison’s The Invisible Man, the Brotherhood was using the narrator as a mouthpiece and to them the narrator is just as invisible as he was to the world at large. The organization seems a lot like the Soviet Union. The Brotherhood only cares for its own interests and the survival of the organization. As a result, no member is treated like an individual and everyone is sacrificed for the cause (the cause is the well-being of everyone). It seems to me that the narrator sees these things about the Brotherhood early on but goes along with their demands in order to get the perks for as long as he possibly can. In the end, he finally rejects his grandfather’s way of going along with everything and leaves. The narrator’s experiences of the world around him allow him to grow into a man who is no longer invisible to himself even though he is still invisible to the world at large. His search for identity, however, is not complete. Our identities continue to evolve throughout our lives and the people we are at old age are probably not the people we were as children. Nevertheless, even if that identity remains the same time it had been challenged over and over by different aspects of life so that the identity that remains is the true one. By the end of the novel, the narrator is only beginning his journey. “The hibernation is over. I must shake off the old skin and come up for breath.” (580). The narrator is finally shaking off the identities that society placed upon him and embarking on a search for his true identity (one that he defines himself). Consider the nature of hierarchy in the poem. What are the forms and customs that govern interactions between kings and warriors, and between the great warriors and the less-great? Hierarchy is very important within the society presented in the poem. In fact, the world is presented and described in terms of its hierarchy. Everyone is positioned within the hierarchy including the Lord who formed Earth (91), Grendel, a descendent of Cain, who was cast out by the creator for killing Abel (105-107), and the council lords who “sat there daily to devise some plan, what might be best for brave hearted Danes to contrive against these terror-raids” (170 – 173). We are constantly told of the lineages because hierarchy also rules family structures. For example, when Beowulf and his crew sail and arrive in Denmark, they are told to give their names and the names of their fathers. Otherwise, they would not be allowed to go any further because they would be considered “undeclared spies in the Danish land” (252 – 254). The captain explains, “we here are come from the country of the Geats and are King Hygelac’s hearth-companions. My noble father was known as Edgetheow…” (260 – 262). Later on, hierarchy is used to identify likeness and familiarity. For example, the Guardian of Scyldings announces, “I knew him when I was a child! It was to his father, Edgetheow, that Hrethel the Great gave in marriage his one daughter. Well does the son now pay his call on a proven ally!” (371 – 376). Finally, the forms and customs that govern interactions between kings and warriors, and between the great warriors and the less great are based on respect. Once ancestry and hierarchy of a stranger is known, then he is accepted into his proper place in society. For example, Wulfgar is instructed by the Master of Battles to relay the message: “He [the Master of Battles] knows your ancestry; I am to tell you all, determined venturers over the seas, that you are sure of welcome” (389 – 394). The respect is not limited to words. Once the warriors are escorted out, a group remains to guard the weapons (399-401). This action shows further respect for the venturers. Anonymous. Beowulf: A Verse Translation. Translated by Michael Alexander. New York: Penguin Books, 2003. Print. Mabel Dodge Luhan and D. H. Lawrence had a very interesting relationship. Luhan lobbied for Lawrence to come to Toas because she was convinced that he was the only one who could write about “the deep mysteries of the landscape and Pueblo life.” I think her perspective shows a fundamental misunderstanding of how writers work. Many people can be inspired by the same landscape but they are inspired by it in different ways. Luhan felt connected to Lawrence through his work and transferred her feelings of the landscape and her feelings toward the people on to him, expecting him to see the same things in the world around them as she did. Despite the fact that he seemed to enjoy the landscape (unlike Nabokov), Lawrence resented Lohan’s intentions and pointed out that she was “using what she learned about Indian life to strengthen and market her own ego.” He saw her approach to the struggles of the Native Americans as a kind of hubris toward people she saw as “less fortunate.” Other than that, Lawrence’s impressions of New Mexico seemed positive. “The moment I saw the brilliant, proud morning shine high up over the deserts of Santa Fe, something stood still in my soul and I started to attend.” It appears to me that his overall impressions would be much better had he just limited his experiences to the land as opposed to the people, particularly white people. Cline, Lynn. Literary Pilgrims: The Santa Fe and Taos Writers' Colonies, 1917-1950. 2007. Consider the importance of hospitality and reciprocity in Beowulf. What exactly does it mean to be a good host and a good guest in the world of Beowulf? The poem works with oppositions. On one hand, social unity is celebrated and, on the other hand, the lack of social unity is denounced. Social unity is celebrated with public celebrations where food, drinks, and words are shared and exchanged (xliii). 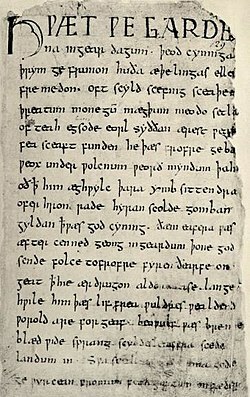 Hospitality and reciprocity are so important that in the beginning of the poem, Hrothgar dreams of sharing: “it came into his mind that he would command the construction of a huge mead-call, a house greater than men on earth ever have heard of, and share the gifts God had bestowed on him upon its floor with folk young and old – apart from public land and the persons of slaves” (66-71). Hrothgar wants to celebrate and share his glory with his men. However, it is unclear whether his hospitality is also extended to his slaves. As a good host, he gives his visitors “rings, arm bands at the banquet” (79-80) and shares with them drinks and food. In contrast to this kind of hospitality, Grendel’s lack of hospitality and reciprocity is denounced. Grendel does not share food and drink and instead swallows his enemies, uncooked, alone and in silence (xliii). This characterization illustrates Grendel’s barbarism. It positions him as the unknown Other, the antagonist who is the embodiment of evil. Consider the importance of the lineage of the hero-warriors in the poem. The narrator always introduces characters in this manner: “Beowulf, son of Beow. . . .” Thereafter, he frequently repeats this formula when he refers to one of the major characters in the poem. Why is there such a great emphasis on the lineage of the hero-warrior, and why is this so important to the characters in the poem? How does their lineage affect their sense of who they are–how they see themselves–and also how the other characters in the poem see them? The main characters of the poem are introduced as son of whomever. There is such a great emphasis on the lineage of the hero-warrior because “the life and death of the hero recapitulate the cycle of age: the heroic generation is born, flourishes and dies” (xlii). This means that if a family begins, it also ends, “if races begin, they also end” (xxxii). A woman is identified as someone’s daughter and “a man is identified as someone’s son or of someone’s kin;” therefore, heroes are treated as “children of men” (xxxii). For example, “Beowulf the Dane…he next fathered four children that leapt into the world” (5). This patriarchal structure is very important to the characters in the poem because it gives them a sense of their identities. Furthermore, it also gives their lives more importance and their glory more value. In contrast to the heroes, Grendel, the antagonist, is not identified as someone’s son. This is an important distinction that separates him from the heroes of the story. Though he is male, he is identified by his mother and his mother plays an important role in his evilness/antagonism/otherness. Instead of positioning him in the patriarchal world of heroism, Grendel exists in the matriarchal world of the unknown/ the other. Instead of a child of men, he is a child of women. Therefore, by separating Grendel from the world of heroes that the protagonists exist in, the story promotes Grendel as the unknown/ the other who must be destroyed. Ralph Ellison chose an anonymous first-person narrator for Invisible Man in order to connect his voice to the reader on a very personal level. The reader does not know his name or what he really looks like but hears his thoughts and sees his observations. While personal background information about the narrator provides the reader with context for his experiences, it also creates barriers between the narrator and the reader. But the invisible man remains a mystery for basically the entire novel blurring the line between the narrator and the reader. In other words, the style of narration allows the reader to experience what the narrator is experiencing and the invisible man’s voice becomes the reader’s choice. Thus readers of all races, genders, and cultural and socioeconomic backgrounds are able to see themselves as the invisible man and to connect to him in a way that they would not be able to otherwise. While Ralph Ellison’s narrator speaks to the reader in first-person, his observations of the world around him are expressed in third person. His narration is not confined to his own thoughts and feelings. Instead, the narrator’s extremely detailed observations of place establish the setting and the mood of each scene. In many scenes, the invisible man appears to be almost a fly on the wall, someone who is merely observing what is happening around him. The style of narration allows Ellison to leave the narrator’s head and depict the environment from a perspective of an almost unbiased observer.